Players should wear predominantly white clothing, excluding shoes, although coloured tracksuits are permissible during knock-ups.. Players must arrive AT LEAST half an hour before their match. We are playing to a TIGHT SCHEDULE. For each two minutes a player is kept waiting for her opponent on court (even if the match starts early and is within a quarter of an hour of the scheduled time) a game will be awarded to the waiting player. Knock-ups will be limited to two minutes. The timer for the knock-up will be started as the players in the previous match leave the court. Please be sure you are ready and waiting to go on court as soon as the previous match finishes so that you do not lose any knock-up time or games. Matches will not be timed. The Tournament Committee reserves the right to revise handicaps at any time if necessary. The decisions of the Tournament Committee are final. The Saturday Tournament Dinner will be held at the Club at Leamington, at 8.00 for 8.30pm. A list of those who have booked in for dinner is attached. Please let Katy know if there are any changes to this list – and if you have any dietary requirements. 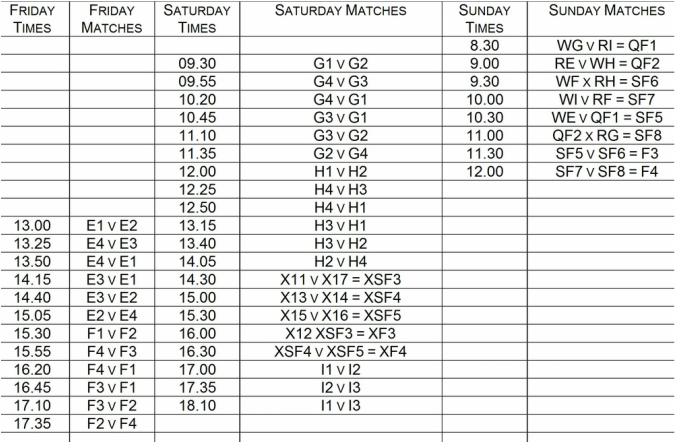 ​In the Singles Round-Robin for the Groups of four players, all matches: 25 minutes allowed, starting at 1 all and playing first to 6-game set; for the Group of three players, all matches 35 minutes allowed, starting at 1 all and playing first to 8-game set. There are nine Singles Round Robin Groups (four in Division 1 and five in Division 2). Group winners and Runners-up go through to the knock-out of the Singles event: all knock out matches, 30 minutes allowed per match, 1 first to 6-game set, starting at 1 all. 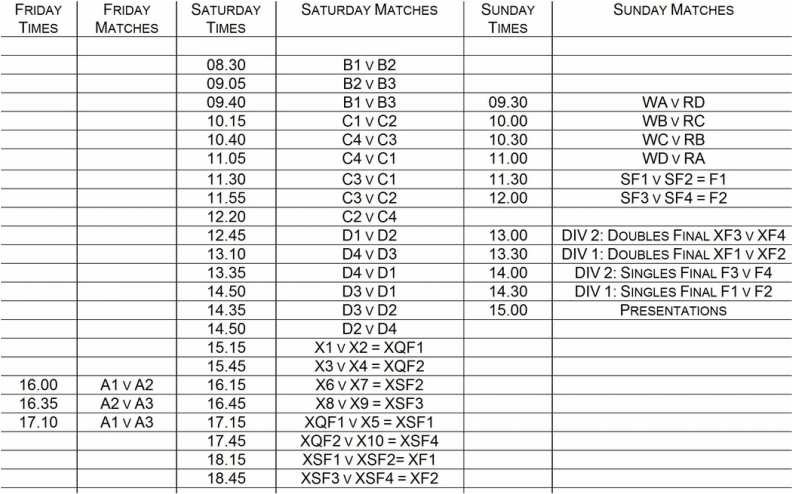 In the Doubles knock out tournament all matches: 30 minutes allowed, 1 first to 6-game set, starting at 1 all. Matches will not be time limited, but knock-up time will be strictly limited to 2 minutes. 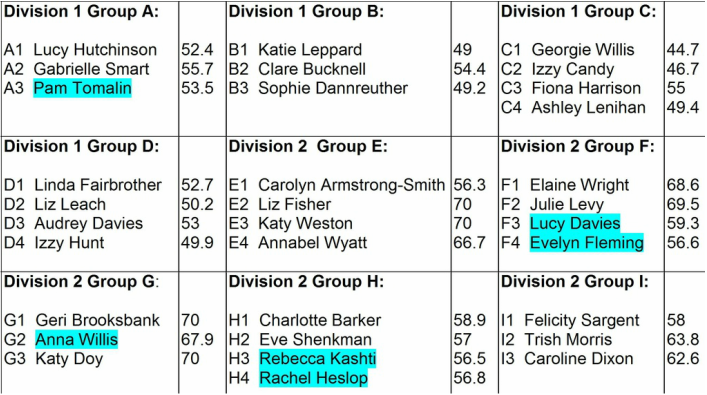 Groups are as follows - handicaps (both singles and doubles) have been checked on and updated from the National Handicap system; they will be rechecked on 12 November 2015. In Division 2 the singles handicaps have been capped at 70. Please note that as singles/doubles handicaps are different, there are a few people who may be in different divisions for singles and doubles. Their names are highlighted.